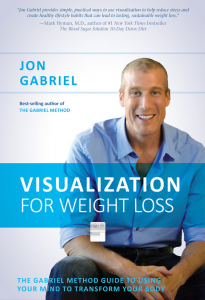 The first chapter of Jon Gabriel’s newest book, Visualization for Weight Loss, says it all: Lose Weight From the Inside Out. While that may sound a little new-agey for some, science has shown that there is a strong connection between your mind and your body when it comes to health and well-being. In late 2001, Jon Gabriel weighed 409 pounds and was miserable. He had tried every diet, but nothing helped. His wake-up call was missing a flight—one of the planes involved in the September 11 tragedy. At that moment, he decided it was time to re-evaluate his life, which included a thinner, healthier version of himself. Using his background in biochemistry, Jon discovered the real reason he was morbidly obese: negative self-talk. That kick-started his journey to conquer his weight issues, with amazing success. I’ve learned that the biggest challenge in weight loss is not finding the perfect diet or the perfect exercise routine. The biggest challenge is convincing your brain that your body needs to be thin. From there, everything flows naturally. Jon has made it his mission to help people all over the world lose weight and live the life of their dreams. In Visualization for Weight Loss, Jon shares the science behind excess weight and teaches you how to maintain lasting results without feeling deprived. Implementing his life-changing visualization techniques takes only eight-twelve minutes per day, but can dramatically alter your body, your health and your well-being. Get the first chapter free and then pick up a copy of his book and visualize your way to lasting weight-loss success.